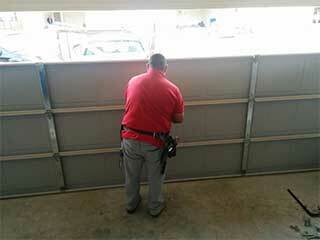 Garage door replacement is something every homeowner should eventually consider. This can not only can end up being the less costly option in the long run (seeing as you won't need as many repairs as you will with an old door) but it can also offer you some added safety and security. There are many reasons why you'll need to get a new garage door installed, but the main ones are simple. Aside from the obvious one, which is an old door that can no longer perform as well as it used to, the main reason would be to benefit from the latest technological advancements or the attributes a different door material could offer you. Another reason why you may want to consider garage door replacement is that you may find a new door type to be more efficient for you. Overhead doors, for example, especially up and over doors, often require additional space outside your garage, as well as more backroom space inside it, but not a lot of headroom. Roll up garage doors, on the other hand, require very little backroom and zero space outside your garage. They only need some headroom, as when they open they are stored above the door like a rolled up carpet. Wood is a natural insulator, which means it will help you maintain a desired indoor temperature, which will save you money on your electrical bill. Wooden doors are also considered much more beautiful and they possess a greater "curb appeal". However, wood does need to be maintained much more frequently, as it could develop rot and warping, and needs to be repainted annually in order to be preserved. A steel garage door will grant your home an added sense of security. This material is also very durable and won't be damaged easily. It will, however, require a more powerful opener than, say, aluminum. Steel can also develop rust, so it will require some regular maintenance and may not be a good choice for homeowners who live in tropical climates. This material is usually preferred for its very low maintenance requirements, as well as the fact that it's relatively cheaper than its counterparts. It is also very light, and won't require a powerful opener in order to move. The downside of aluminum garage doors is that they will get damaged more easily, and aren't very insulating. It's often the wiser choice to go with a name brand manufacturer when buying a new garage door system. Company's such as Genie and Liftmaster are known for their reliability, as well as for their special features, such as the Genie Intellicode and Liftmaster's Security+. Contact our experts at Garage Door Repair Huntington Station to consult with our experts on which type and material of door is the best one for you.